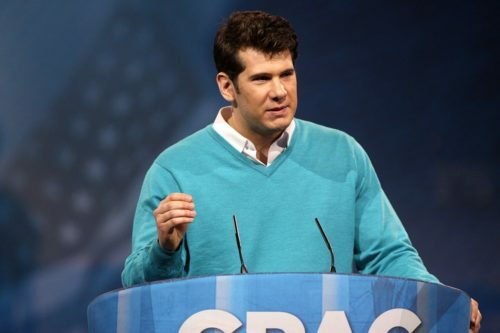 Steven Crowder, a former Fox News contributor and host of the popular rightwing podcast Louder with Crowder, went “undercover” to an LGBT community center to expose a conspiracy of transgender people abusing government funds for nefarious purposes. He didn’t find that, so he edited the video to make it look like transgender people are conning Medicaid out of money. Crowder and his wife went to the Pride Center of Vermont on October 20 to attend a “What the Healthcare?” workshop, which is intended to help transgender people navigate the health care system. Crowder said that they were “behind closed doors” and said that he lied about he and his wife being “the basic B of LGBT” in order to gain access, as if the meeting were secret and the Pride Center was checking everyone’s LGBT status before the discussion started. The recorded footage was then cut to 14 minutes of very short clips, which were then weaved together with mocking commentary into a 28-minute video. “This whole meeting is about how to get taxpayers to pay for their surgery. Most of these people are completely unemployed,” Crowder says in the video, apparently not understanding the relationship between transphobia and transgender unemployment. “Free hormones, breasts and vocal coaching? What’s next? Demanding taxpayer-funded electrolysis?” he says, as if he needed undercover video to prove that transgender people want decent health care access. While Crowder implies that he found unethical behavior, the video didn’t get 700,000 views before it was removed because one person told another to find a good doctor. The tone suggests that the point of the video is to laugh at transgender people and get mad that taxpayer dollars are being spent on anything besides farm subsidies and the military. “Being exposed like that, the only word I can really use is ‘devastating.’ It shakes you to your core,” said a trans man interviewed by Seven Days Vermont, who didn’t want to be named. The stunt isn’t illegal, though. In the state of Vermont, only one party has to consent to being recorded. YouTube removed the video at the Pride Center’s request, citing privacy concerns. This is not the first time Crowder has used deceptively-edited video. In 2012, he attended a union rally and posted video online that showed him getting punched by a union worker. He also posted pictures on Twitter showing his injuries. The video was shown a few times on Fox News before Crowder released the unedited footage, which showed that the person who punched him was getting up off the ground. “It’s pretty clear the person that they wanted to charge was acting in self-defense,” county prosecutor Stuart Dunnings III said when he announced that he would not be pressing charges against the union worker.